The Sports Design Blog » Stop it, Georgia Tech. Just…Stop It. Home » Uniforms » Stop it, Georgia Tech. Just…Stop It. Why? Why in the last five years have we had consistently bad sports uniforms, Georgia Tech? Up until last night, it had just been Russell’s bad templates with GT’s colors (or something somewhat resembling them). But last night we got our own special treatment from Russell, and boy was it a mess. It started when players tweeted a picture of the honeycomb helmet last week, and it came to an ugly conclusion just before kickoff against Virginia Tech last night when the full uniforms were unveiled. I had feared when I saw the honeycomb (or truly, yellow jackets’ nest) pattern on the helmet that it may be applied to the jerseys, too, and that turned out to be an understatement. While it may be a nice design element when used subtly, I find it a little corny. When plastered everywhere not-so-subtly, it’s just awful. The worst part of the pattern Russell used is their attempt at making it 3-dimensional; it looks like bubble wrap. If Russell had just chosen the numbers or the shoulders (just one) and applied the hexagonal pattern like on the helmet with no 3D effect, it could have been alright, similar to Northwestern’s architectural lines on their numbers. The fact that you can see the pattern on the numbers from more than a few feet away makes it obnoxious. Honeycomb aside, there are all sorts of problems with this uniform set. For one, the gold on the helmet stripe and logo don’t match the gold on the jerseys (gold consistency is not a new problem at GT). And the honeycomb wasn’t the only thing wrong with the numbers; the font is a bit odd. Perhaps the worst part to me is the gold (honeycombed) name plate on the back. Last night’s uniforms (right) didn’t have them, but the side stripes on the other white set (below and here) are absolutely horrible. The gold uniforms are the worst of the set, and the blue may actually be the least offensive because the white numbers make the honeycomb less visible. But Georgia Tech should be wearing gold or white. And the worst news is that these were not a one-time publicity stunt; these are Georgia Tech’s 2012-13 uniforms… Luckily, the traditional gold helmet will stay in the rotation, but I can’t imagine it will look good with these monstrosities. Now that these are here to stay for the season, here’s a humble (and serious) suggestion for next season. Let me take a shot at designing Georgia Tech’s football uniforms. I’ll do it for free and I’ll give you as many designs as you want, from super-traditional to super-modern, but I can guarantee you this: None of them will be laughable or ugly. 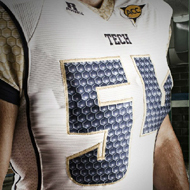 We won’t be hearing how Georgia Tech looks like they’re wearing bubble wrap, chicken wire, or Magic Eye uniforms. You don’t need crazy uniforms to garner PR; great uniforms designed for free by a fan and alumnus who is a professional graphic designer should bring some. And I’ll gladly do the basketball uniforms, too, because while not covered in honeycomb, the new basketball uniforms have a host of design issues themselves. I agree, the design of these uniforms is all over the place. They wouldn’t have been that bad if they had left the numbers alone, and just stuck with a solid color. It, instead, makes the uniform look like a really, really awful mesh. Great idea. 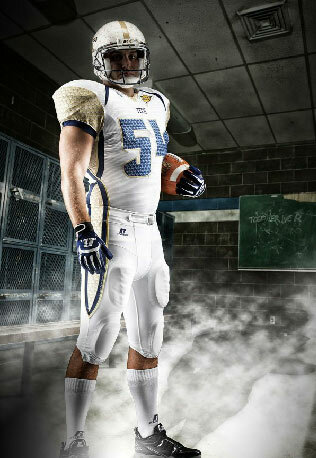 I would love for them to contract one graphic designer who is a true GT fan to design the unis next year. Agree w/ everything you said. These are absolutely the worst uniforms I’ve ever seen. I was hoping last night’s uniforms were one of those special occasion offerings. You just burt my bubble to hear we have to put up with this embarrassing mess all year. Uggh! Also I don’t quite see what’s so bad about the basketball uniforms. Perhaps you’ll say in another post? I hope Tech decides to take you up on your offer, though. Rework the side paneling to be less intrusive to the overall design. Rework the hex print on the shoulders and paneling so that the hexagons are vary in size and don’t all touch one another (like the accent motif recently placed on the bottom and edges of the video board at McCamish Pavilion). This will take away the flatness of the print. Without shading just make this pattern white outlines on a gold background. It shouldn’t be visible on TV or from the stands, but should be a subtle texture seen by the players and in close-up photos. Add a gold helmet with white hex pattern and white logo to the rotation. I’ll defend the hexagon pattern as a good idea when used SPARINGLY. It’s a strong shape. It cannot be stolen for use by anyone we play against, and thus it will become synonymous with GT in FBS. And it’s simple and easy to riff on for subsequent designs. I’d like to try a design where the shoulders have small “TV numbers” inside a large hexagon outline. This way, you put one or two hexagon motifs on the uniform (if you keep the helmet shell unchanged) and don’t put it on every surface. It’s nice, but it shouldn’t be overdone. I agree about the basketball uniforms, they’re an absolute joke. The football unis i liked though, they need to be consistent with the colors which Russell can’t ever seem to do, but I like them, I do agree that the hex pattern should have been left 2-D and I think it would look better a little larger as well, its a ton better than last year though or any year since CPJ has been here, so I’m happy. I wish they would let you take a stab at it though, I really like your designs. Chorl, yeah I plan to write a post on the basketball uniforms closer to basketball season, but mainly the drop shadows are so dated and huge. And the stripes on the side are busy and ugly. I am extremely disappointed, I thought when teased us with ‘We’re going to pay homage to the GT tradition’ we would finally be rid of the Russelll clown suits and see something similar to what you came up with. I was so upset I sent following email to Ryan Bamford ASST. Athletic Direct at GTAA…. My first e-mail to him…. It was with great anticipation that I looked forward to seeing the new Georgia Tech football uniform design. 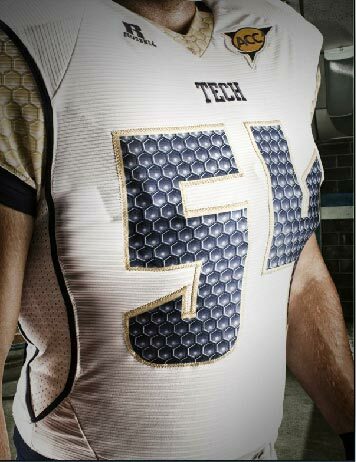 The design that was going to “pay homage to Georgia Tech’s past”, and be rid of the ‘clown suits’ the players have been wearing for the last 5 years. Imagine, if you can, at my surprise when the players came out dressed in ‘white (so much white that’s all I could see) and beige” . Could you please tell me, how in the world this uniform paid homage to Georgia Tech’s past ?! Because I missed it. I looked at the variations on the athletic site and read the statement that “ the hexagonal pattern is synonymous with Georgia Tech”; since when! I know you’re probably getting lots of uniform feedback today (good and bad), so please put me in the BAD pile. I have complained about the Russell designs since the contract with them was signed, and they have changed, every year, but I keep hoping that someday the Jackets will wear football uniforms again. I know, I know, I know, the prevailing trend and justification is ‘the kids like them and it helps recruiting’. Could you tell me please which one of our recruits signed with Georgia Tech because they thought we had cool unis? I reject that reasoning. I know you folks at the GTAA work very hard, but you really need to get in touch with your fan base ! For the first time in 24 years I have time on Saturdays and I bought season tickets (5). I came to the Spring Game, and Fan Day. I bought $200. of Tech Gear for my family and myself to wear to the games this year. I was so excited, now I’m so deflated. You guys just don’t get it. Those uniforms are unrecognizable to me, when the team runs out wearing the ‘clown suits’ or now the ‘silly epcot, chicken wire suits’ my brain and my emotions will say..” what team is that? !” Will I dress my daughters in ‘white and beige’? No! Will this influence my decision next year to renew season tickets? Yes! As always, we appreciate your comments and the support of Georgia Tech football. After all, we are all working toward the same goal of making Georgia Tech great. Uniform design is a very hot topic among student-athletes. College football players today want to feel they have the most modern, cutting edge designs in which to perform. Since Georgia Tech, by its nature, is at the forefront of modern technology and innovation in the world, does it not stand to reason that our football program should follow suit? It is important that we are providing the apparel and design that attracts the very best student-athletes nationwide. All who would believe that uniforms are not an important component of the recruiting process are very much mistaken. I can recount that last night, from our players perspective, the uniforms and helmets were well received. We have heard much about the “uniform tradition” at Georgia Tech. While we all love the simplicity and tradition of the khaki uniforms worn under John Heisman and William Alexander, the long-sleeved white jerseys with stripes on the arms worn under Bobby Dodd, the bright blue jerseys and white pants worn during our 1990 National Championship era under Bobby Ross or the “Vegas Gold” jerseys displayed under George O’Leary and Chan Gailey, the idea that there is a “traditional” Georgia Tech uniform is impossible to tie down. Our brand is the interlocking GT which remains a strong component of the new helmet. It will remain a strong component of our gold helmet as well, which we will continue to wear. Let’s just all do what we’ve always done — love the program, support those who represent this great Institute and pull together to embrace change when it comes in the spirit of trying to get a little better. p.s. I’ve included some media coverage on the uniform topic below if you are interested. My answer back to him…. Thank you so much Ryan for your quick response. I have heard the arguments you’ve listed below and I can also see the GTAA has crossed the ‘Rubicon’ and is determined to move on. Unfortunately I can’t move on with you. Even though I am older, I can embrace change, when the change is worthy of embracing. I’ve worked in the aviation industry for 40 years and have been pretty good at changing. We will just have to disagree. It’s unfortunate, as I said before, I was excited as I ever have been about coming to the games this year. I wish you well in your endeavors and I’ll do my best to enjoy my season tickets this year. I’ve had my say about the uniforms and in the end people always vote with their pocketbooks, as will I.
Honeycomb design: Good idea. Bad execution. Here’s a suggestion: how about ditching Russell Athletic for Nike or Under Armour. Even Adidas can make a good “classic-looking” uniform. I’m tired of GT having the worst look on the field EVERY Saturday. It’s disheartening. To Lex Williams: Threats to throw the baby out with the bath water will not intimidate or steer the GTAA. You (and everyone else) need to understand ITERATIVE design! The uniforms are not the “forever and ever amen” to what GT will look like on the football field; they’re a first step in a new design direction. But the direction of change has been constant at Tech. Bobby Dodd’s teams were great. So were Alexanders’, Heisman’s, and the one good Bobby Ross team. Newsflash – THEY ALL LOOKED DIFFERENT ON THE FIELD! So this is 2012, and GT is moving forward while Russell Athletic tries to get its stuff together. You have a chance to get on board with it knowing that Tech will continue to look different every year – maybe even every game. The logo’s still on the uniform. The Ramblin Reck is still running, and we’ll still sing all the same fight songs. Georgia Tech will still win football games, and you will either make your choice to GET WITH IT or get left behind by it! You like stripes on solid colors while today’s football players like patterns and piping. Why is that such a big problem for you and the other old alumni?! Our jerseys have been 4 colors, we’ve had at least 5 stripe patterns, 4 helmets, three logos, and even three nicknames for the team! Tech changes. It always has. Might as well try to start innovating while we’re at it. It will always be childish to throw the baby out with the bath water. That’s a professional Georgia Tech-educated designer’s say in the matter. I’m 21. These are UGA-LEE. It breaks my heart that this is not a one-and-done. As for the honeycomb, WE ARE THE ENGINEERS NOT THE BUGS!!!!!!! Yellow Jacket comes from wearing GOLD jackets! Not a buzzing bug. F recruiting! Academics before athletics! Can’t we just look respectable?! On the other hand, if someone can prove unto me using evidence that these embarrassments to the alumni lead to holding 4th quarter leads and winning the State, ACC, and NCAA championships then I’ll calm down a bit. A BIT! Josh, you’re discussing a football uniform, yet your logic is “F recruiting! Academics before athletics!” In what world does anything the GTAA does affect the Institute AT ALL?! Are you afraid having a football uniform that doesn’t look like it’s 1952 will mean our academic rankings will now plunge? In that case, what is our prestige based on? Hint – It aint football, at least not to anyone not named Clemson or Duke. As for the use “Yellow Jackets.” John Heisman himself wanted us called the Yellow Jackets after it was brought up by the media, and he knew full well it would turn into references to the similarly-named wasp. In fact, depictions of the yellow jacket wasp to represent GT’s teams started cropping up almost immediately after he gave it his blessing. That was nearly 100 years ago. 100 years of the wasp, but we can’t use its nest for anything? Come on. Young football players want to be talked about. Russell Athletic is contractually obligated to try something new annually. Therefore, they’re trying a distinct new direction that will evolve over time, and suddenly our fanbase insists we’re Alabama in terms of uniforms. Newsflash – teams that don’t have double digits of national titles and one of the biggest merchandising deals in all of sports shouldn’t even try to emulate Alabama. They’re an exception, not a rule. New uni’s and evolving logos are just fine. I do wish we could pick a great uniform and stick with it, and I’ll always lean toward more traditional than modern, but if we’re contractually required to come out with something new every year and want to be young and hip I can accept that… IF… the uniforms aren’t just an awful-looking gimmick. 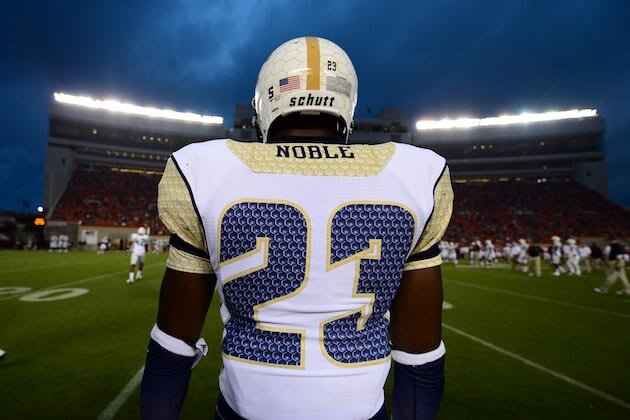 The uniforms GT wore Monday may very well be the worst football uniforms I’ve ever seen. If we come out in some awesome modern uniforms, great, but they don’t need to look like costumes. SDB, I agree that the new team Russell hired made some poor design choices. Far too much patterned print, for example. But I think the tweaks I recommend in my first comment would do a lot to save this design if there should be a next iteration of it. If I had access to photoshop I’d make a comp or two just showing how salvageable the design actually might be with some help. Of course, if we’re going to use the hex pattern, I have some ideas as to how to make it look more Oregon and less…Colorado State. I’m not a huge fan of the whole new design concept and it may have some problems but i’m just happy that GT is finally at least showing a desire to shake it up a little bit. I have been disappointed for years at their lack of style and creativity but at least this is an attempt at showing a little “Hipness” I couldn’t agree more that they need to get rid of the YELLOW. The colors are old gold and white and thats what they need to be consistently throughout all uniforms, print media, etc…. I like the navy but the three colors need to be consistent in everything that GT does. The designer trying to hard to make the uniform look good. The simpler the design is better the overall look will be. Big time Georgia Tech fan, also a Purdue grad and crazy about the Boilermakers. Both seem to have the same problem with the gold consistency, which you have addressed quite thoroughly. And while Purdue’s new Nike pro-combat full-time uniforms adopted in 2011 seemed at the time a bit uninspired, I’ve kind of grown to like the simplicity. It actually looks good on the football field as a complete piece, which I suppose is the point. If anything, these are over-inspired. And you’re right, the blue looks the best. I happen to like it when Tech wears blue (I thought the 1990 home uniforms were great), but you are correct, their colors are gold and white. They have the best logo and best mascot (Purdue Pete might want to fight you on that one. Beware, he rides a train and carries a sledgehammer) in college athletics, but can’t seem to get it together. I was at the new Thrillerdome for the UNCW game a couple of days ago, and I like the basketball threads (though I think they stole your idea of just going with “Tech” on the front lettering). Anyway, keep up the good work. Someone has to. I wish GA Tech would get a new sponser. I dislike Russell Athletics. 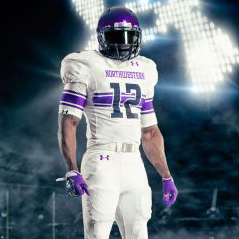 They should go to Nike, Adidas, or Under Armour. Let’s keep it simple. It looks like chicken wire. A failed design. So, change it and move on. hahah sounds like they need to hit up https://gamegear.com/ or find a new designer. I have noticed, these uniforms aren’t great, but after reading this I really see it now. I like your critiques though, having fun with it. Stop it, Georgia Tech. Just...Stop It.